What Are The Moonbeam Awards? The Moonbeam Peacemaker Award was established to honor the best book for promoting world peace and human tolerance, in memory of Mattie J.T. Stepanek (1990-2004), whose poetry and messages of hope and peace have inspired millions of people around the world. 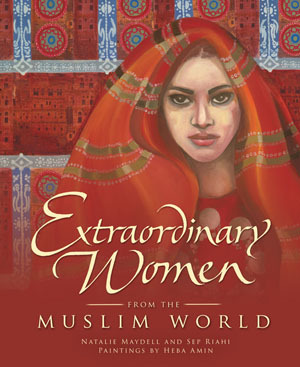 This year’s gold winner, Extraordinary Women from the Muslim World, by Natalie Maydell and Sep Riahi, does just that. The book, filled with the illustrations of Heba Amin, introduces readers to 13 Muslim women in history who have lived extraordinary lives and influenced their communities in a positive way, often overcoming extreme hardship and inaccurate stereotypes that have been placed on the role of women in Islam. In addition to showing the impact these women have had throughout the years, Extraordinary Women from the Muslim World seeks to make a difference in the lives of Islamic women today, inspiring them to fervently pursue their goals. All proceeds from the special edition hardback series will be donated to Islamic Relief to benefit the women and children of Sudan.